How cool is this and where was it when I was in school? When I was first sent an email from Grammarly telling me about this, I opened it up, scrolled through it and closed it. A few days later I was on the CNN website, reading whatever the news of the day was (probably ten posts on the Pope’s visit to America and at least three on Donald Trump’s latest rambles), and a link on the bottom of the website caught my eye. It said, “Grammar App Helps 99% of Students Get Better Grades”. Of course, I clicked on it, and when I did I was astonished at what I saw. 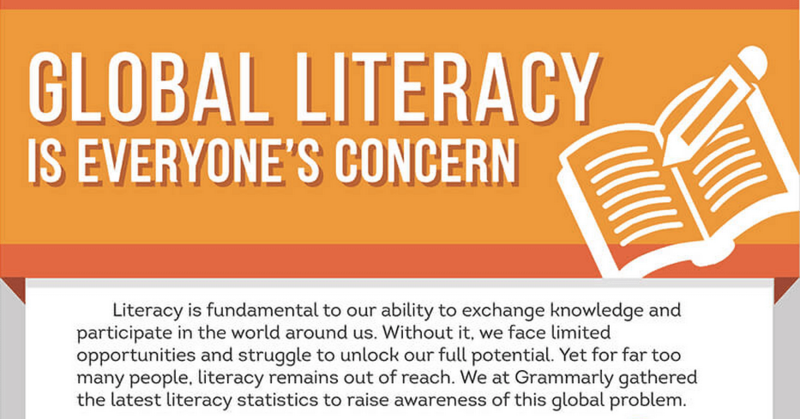 757 million adults 15 years and older are illiterate. 757 MILLION! Something is terribly wrong with that, and I’m not just saying it because I write books for a living. Anyhow, here is some information on that (click on the image below). Also, I feel like I need to tell you that I installed Grammarly on my computer and it has corrected three things on this blog post thus far ;).